Science fair project display boards shouldn't require a college degree to put together! That's why we've made our science fair project display page as easy to understand as possible. At first it may seem like a bit much. 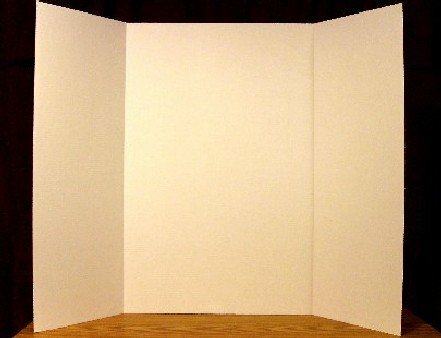 But we recommend you read everything on this page to get a better understanding of what a winning science fair project display is. A little time here will make your time at the science fair much more rewarding. 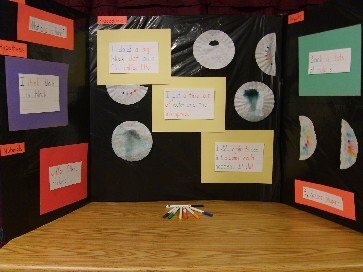 Let's create your science fair project display! ...well, you'll do it right anyway. So you don't need to know! The size of board, the way reports are written, the type of labeling required and many other things come into play. So make sure you know what your school requires! ...make a list first thing, then gather your supplies. Your project may include additional supplies. So make sure you list everything you need so that you can get it in one trip. 3. Did you get eveything you needed? ...every school is different. So make sure you know what your school requires! ...you get to start making your display! The important thing here is to be creative. When you make your title and labels, don't just use the same old same old. For instance, if your project is about the effects of heat on our oceans, use sea shells to create an attractive title. If you plan on a project theme about horses, use rope letters in your title and labels. Also use appropriate and attractive color schemes. A project about space could have a black color scheme. But black would never work for a project about light! Use appropriate colors! Even the way you display your infromation should reflect who you are. But keep it neat whatever you do. 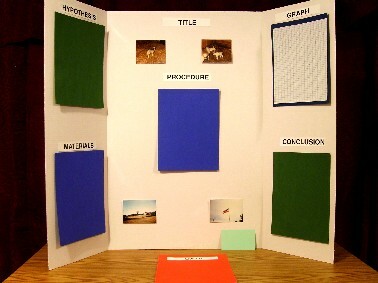 Make sure your title and labels are ready to be placed on the science fair project display board. The judges are looking for more than just originality in your layout. Be too original and you'll turn the judges off. 6. Now assemble each part of your display. If you have a pre-made cardboard display, begin gluing the pieces on where you have already decided they would go. Make sure everything is glued tightly. 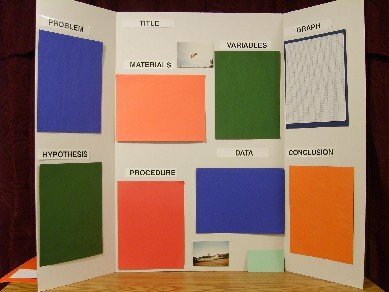 Plan what you will put in front of your science fair project display. If you have a model, photo journal, samples or report folder, display it neatly and attractively on the table in front of your display. Although many science fairs have a "hands-off" rule, be prepared to have your "stuff" handled anyway. At the very least, the judges will be touching your project. 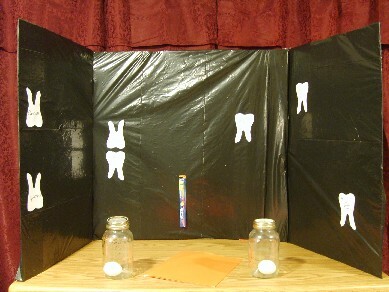 Below are some ideas for science fair project displays. But don't just copy what you see. Use your brain! Be creative, and come up with something original! Your science fair project display looks great. Click here for the homepage!